Hello and welcome to Todd Miller TV. Today’s episode is Las Vegas Home Price Appreciation and what I’ve got here is a map and it’s by zip code. It shows the entire Metro Las Vegas area so it has got Las Vegas. It has got Henderson. It has got North Las Vegas and it breaks down all the zip codes and it shows the price appreciations. So I know you can’t see this really clearly even though this is in HD but I’m going to attach it below the video on Todd Miller TV. So if you’re looking at this on YouTube, you have to go down. Click over to my blog and it will be attached on the blog. You will be able to download Las Vegas home price trends as a PDF and look at it. 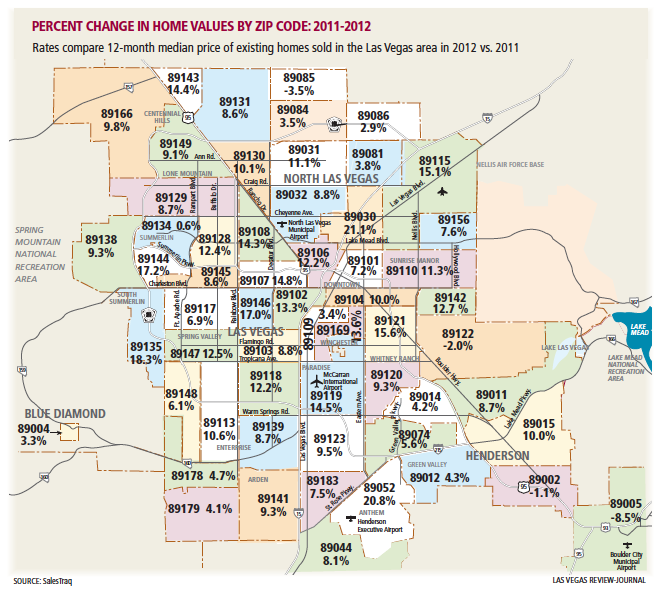 It’s very cool because what this shows is the appreciation of home prices in Las Vegas from 2011 until 2012. So it’s with the end of 2011, end of 2012. It doesn’t include the beginning of this year. I’m going to go over a couple of zip codes that are of interest for Las Vegas home price trends. One is 89052. That would be the Anthem Henderson area, the southern edge of Las Vegas. It’s sort of the southwest area in Henderson. 20.8 percent is the change in median home prices. That’s the increase. Here’s another zip code for Las Vegas home price trends, 89135. That zip code appreciated 18.3 percent. That is the Summerlin. Here is another one, 89144. That’s also in Summerlin. That appreciated 17.2 percent. What’s really interesting is some of the zip codes that you wouldn’t think for Las Vegas home price trends– I will give you a couple of examples: 89146, 17 percent; 89107, 15 percent; 89108, 14 percent; 89169, 14 percent; 89121, 15 percent. 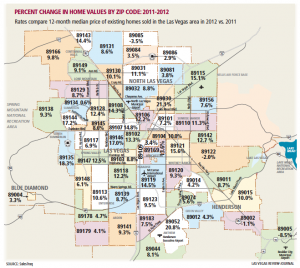 If you know those areas, those are investment Las Vegas home price trends rising in their homes. But the reason the prices have gone up quite a bit is because we’re talking about percentage change and those areas were really hit. Those were some of the areas where they had the $50,000 houses. So, if the houses were 50 and now it’s worth 55, it has gone up 10 percent. So you can see how a small percentage – the interesting thing about Anthem and Summerlin is those homes are more expensive. So when you have appreciation in that area, now you’re talking about a home that’s 300, that’s worth 350 or something. So we have a higher dollar amount. So I thought I would share Las Vegas home price trends with you. Technically it’s called the percent change in home values by zip code. I will post it for you under the blog. That is my update for today and hope to see you on another video. Thanks.